← Will cold conditions return? The Met Office has released its annual forecast of the rise in atmospheric carbon dioxide concentration for the coming year. Carbon dioxide will continue to rise as a direct consequence of emissions from fossil fuel burning and deforestation. But, in 2018 the rise is predicted to be smaller than in the last two years due to the temporary effects of climate variability on natural carbon sinks – locations which can absorb more carbon than they release. The La Niña event has involved a temporary cooling of ocean temperatures in the eastern Pacific Ocean and shifts in weather patterns around the globe, especially in the tropics. Generally cooler, wetter conditions in many places cause enhanced vegetation growth, drawing down more carbon dioxide from the atmosphere than usual. While this is not enough to halt the rise in carbon dioxide concentrations resulting from human-caused emissions, it does slow the rise for a few months. Forecast CO₂ concentrations at Mauna Loa over 2018 (orange), along with previous forecast concentrations for 2016 (blue) and 2017 (green) and Scripps Institute measurements (black). 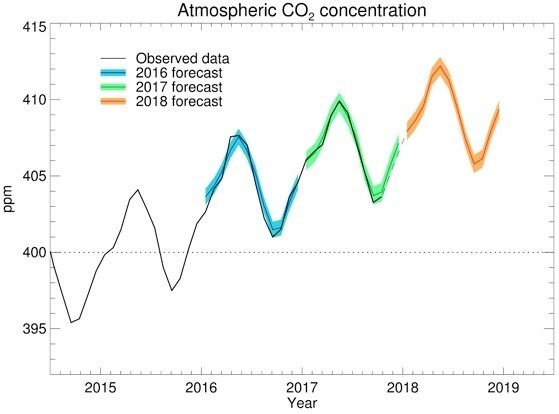 The Met Office forecast relates specifically to carbon dioxide concentrations measured at the Mauna Loa observatory in Hawaii. The forecast overlays Scripps Institute measurements. The average concentration at Mauna Loa in 2018 is forecast to be 2.29±0.59 parts per million (ppm) higher than in 2017. This increase is slightly less than that seen last year, and much less than the record rise of 3.39ppm seen in 2016, which was successfully predicted by the Met Office. As a result of this rise, the annual average carbon dioxide concentration at Mauna Loa is forecast to be 408.9±06 ppm. As usual, the concentration will fluctuate over the year in response to carbon uptake by vegetation in the northern hemisphere summer growing season, followed by a release of carbon in the autumn. The monthly average concentration is forecast to reach 412.2±0.6 ppm in May before dropping back down to 405.8 ± 0.6 ppm in September. Table 1. Forecast monthly average CO₂ concentrations at Mauna Loa over 2018. My forecast is that global CO₂ levels as measured at Mauna Loa in February 2019 will be at least 410.25 parts per million if not a little higher.